The ultimate taste of spring is found in this pie! You can count on receiving compliments from appreciative guests for this beautiful and delicious fresh strawberry pie. Serve with sweetened whipped cream or vanilla ice cream. For Crust: Mix flour and salt in mixing bowl. Cut shortening into the flour with a pastry cutter, until mixture resembles tiny split peas. Add the ice water and mix in using a fork. Gather the dough into a ball. Roll dough on a lightly floured surface into about a 12-inch circle and place into an ungreased 9-inch regular or deep-dish pie plate. Place dough in an ungreased 9-inch regular or deep-dish pie plate and gently press dough into pie plate. Trim excess pastry, if needed and flute the edge. Prick crust thoroughly on the bottom and sides with the tines of a fork. Bake crust at 425°F (220°C) on center rack of oven for about 15 to 18 minutes, or until golden brown. Cool completely on wire rack before filling. For Filling: Mash enough strawberries to measure 1 cup. Mix sugar and cornstarch in a medium saucepan, Gradually stir in water and mashed strawberries. Cook over medium heat, stirring constantly, until mixture thickens and boils. Boil and stir 1 minute. Remove from heat and cool to room temperature. With the back of a spoon, gently spread about 2 tablespoons of the filling onto the bottom of the baked pie crust. Fill with remaining strawberries (dry berries with paper towels if to damp). Spoon cooked strawberry mixture over the top of strawberries, distributing evenly. Refrigerate until ready to serve. Serve pie topped with a dollop of sweetened whipped cream or a scoop of premium vanilla ice cream on the side, if desired. 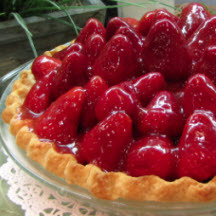 *This is an approximate amount of strawberries, it can be a little more or a little less, depending on what you have...and how high you want the pie be! Tip: Because this pie is made with fresh strawberries, it is best eaten the same day made. Do not make in advance by more than a few hours. Nutritional Information Per Serving (1/8 of recipe): 341.9 calories; 34% calories from fat; 13.5g total fat; 0.0mg cholesterol; 120.0mg sodium; 255.4mg potassium; 54.4g carbohydrates; 3.6g fiber; 32.1g sugar; 50.7g net carbs; 3.2g protein.